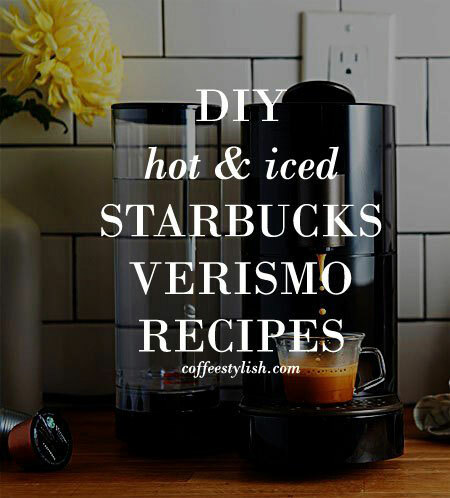 A collection of simple, money-saving Starbucks Verismo recipes you can use to make your favorite Starbucks drinks at home. You’ve probably received the quick start recipe book when you purchased your Verismo machine. It’s a great place to start, but I’ve also adapted some of my favorite coffee recipes so you can make them at home using your Verismo machine. I will also show you how you can use certain products strategically to get the perfect result – and spend less! Directions: Make 1 oz espresso, using top espresso button. Froth milk or heat the milk in the microwave and add to your coffee. If using milk pods, insert 1 milk pod and press the milk button, then insert 1 espresso pod and press espresso button. Makes: 6 oz latte. If you want to make a 12 oz latte, use 2 espresso pods and 10 oz fresh milk. Starbucks recipe: If you want to make a 12 oz latte, Starbucks recommends using 1 espresso pod and 2 milk pods. 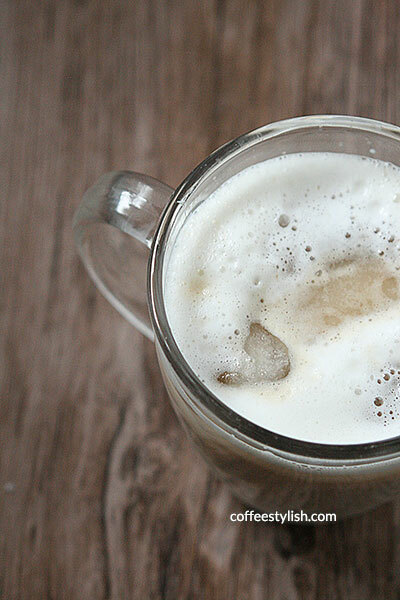 You can easily make a vanilla latte (or any flavored latte) at home with your Verismo machine. Use the recipe above (1 espresso pod + 5 oz milk) and add 1 tbsp vanilla syrup (use 2 tbsp if you’re making a 12 ounce cup) or a few drops of vanilla extract. You can use other syrups too: caramel, peppermint or hazelnut. Directions: Take espresso pod of your choice, insert and make 1 oz espresso using top espresso button. Lift and close the handle without inserting a pod. Press brewed coffee button to add hot water. Makes: 8 oz Americano. To make a grande Americano (16 ounce), brew 2 espresso pods into the same cup. Then add 14 oz hot water, using brewed coffee button x 2. Directions: Put 1 tsp cocoa powder and 1/2 tsp sugar in a cup, add few teaspoons hot water and mix into a sauce. Brew 2 espresso pods directly into a cup with cocoa-sugar mixture. Add 10 oz frothed milk and sugar to taste. Makes: 12 ounces. Starbucks recipe: 1 espresso pod + 1 milk pod + 1 tbsp Fontana bittersweet chocolate sauce ($24.95/ 63fl oz). Preparation: Place sauce in a mug. Brew 1 milk pod (or add frothed milk), then brew 1 espresso pod. Makes: 7 oz drink. Directions: Brew two espresso pods. Add white chocolate chips and stir until chocolate is melted. Add hot milk, sugar to taste and stir well. Garnish with whipped cream. Makes 12 ounces. Depending on what pods you normally use, you can make your Verismo pumpkin spice latte using espresso or brewed coffee pods. This homemade version is like $1.50 per cup! You need: 1 espresso pod + 6 oz fresh milk + 1 tbsp pumpkin puree + 1/4 tsp pumpkin pie spice + 1 tsp sugar. Directions: In a small saucepan, combine milk, sugar, pumpkin pie spice, and pumpkin puree and heat until steaming, whisking occasionally. Brew 1 espresso pod and add milk mixture. Garnish with whipped cream. Makes: 7 oz. You need: 1 brewed coffee pod + 4 oz fresh milk + 1 tbsp pumpkin puree + 1/4 tsp pumpkin pie spice + 1 tsp sugar. Directions: In a small saucepan, combine milk, sugar, pumpkin pie spice, and pumpkin puree and heat until steaming, whisking occasionally. Brew 1 coffee pod and add milk mixture. Garnish with whipped cream. Makes: 11 oz. Directions: heat up 5 oz milk in a microwave or froth with milk frother. Brew 1 chai pod at brewed coffee setting (middle button) and add to your milk. You need: 1 espresso pod + 6 oz milk + 1/4 tsp cinnamon + 1 tsp brown sugar + a pinch of each: ginger, nutmeg, clove and tangerine zest. Directions: In a small saucepan, combine milk, spices and brown sugar. Whisk vigorously to make the froth and heat the mixture on medium-high until it is steaming and fragrant, whisking occasionally. Pour into the cup, place a cup in place to brew and brew 1 espresso pod. Directions: Brew espresso pod at short espresso setting. Put 4 large ice cubes in a cup and really slowly pour espresso over the ice cubes. Add 4 oz cold milk and sugar to taste and stir. Directions: Brew 1 espresso pod. Put 2 tbsp flavored syrup and ice cubes in a cup and slowly add espresso. Add cold milk and sugar to taste then stir. Directions: Brew one espresso at short espresso button. Add cold filtered water and 4 large ice cubes. Directions: Brew one espresso at short espresso button. To put together your drink take a cup and add 1 tbsp vanilla syrup, cold milk then ice cubes. After that, slowly pour in espresso and drizzle with caramel sauce. Directions: Brew espresso pods. In a shaker combine 1/2 cup ice cubes, espresso shots and 1 tbsp simple syrup/sugar. Shake for few seconds. Pour in a cup and add a splash of milk or half and half. You can easily make your own cold brew concentrate at home. You don’t need a Verismo machine, just ground coffee. Starbucks recommends to use their cold brew coffee, but you can really use any blend that you like. And, here’s a step by step guide on how to make your own cold brew coffee. Milk pods: You will notice that most of these recipes call for fresh milk, and for several reasons. First, fresh milk always tastes better than powdered milk, so I like to use fresh milk. This will also save you a ton of money – instead of buying milk pods, you can use regular milk and use that money to get the coffee pods. You can also easily adapt these recipes and make them dairy-free. Simply substitute with your favorite dairy-free milk options like rice, soy or almond milk. Not using milk pods with also help keep your machine clean. The problem with Verismo is that milk from the pods goes through the entire unit and it can’t be cleaned properly. These milk protein build ups may result in bad, sour milk odor which is pretty much impossible to remove once it’s there. That’s why prevention is really important. I suggest avoiding using milk pods in your machine from the beginning, if possible. You can either heat the milk on the stove, or get a milk frother. In fact, if you want that nice foam on top, the frother is probably the best choice. You can find some nice options on Amazon for $40. Saving money: While they are super convenient, Verismo pods aren’t always the most affordable option. The best way to save on Verismo pods is to buy them in bulk. Starbucks no longer sells Verismo pods online, but you can purchase them online at Bed, Bath & Beyond and Amazon. Using your own coffee in Verismo: Starbucks doesn’t make a reusable Verismo pod, but these foil seals for k-fee pod type are super popular. They do require more work but it’s a good option if you want to use your own coffee in Verismo machine. Manufacturers recommend using only original pods. Using different pods can sometimes cause damage to the machine. This rarely happens, but let’s say that original pods/capsules are always the best option. Use other pod options at your own risk. I hope this helps! Enjoy! Hi! My name is Allison, and I am new to the Verismo community! I drink cinnamon dolce lattes (hot) from Starbucks every day, and was wondering if you had a recipe for making the cinnamon dolce latte (hot) with my Verismo?? Hi Allison, I would love to help! For a cinnamon dolce latte, you need 1 Verismo espresso pod, 5 ounces fresh milk – or 1 milk pod, and cinnamon dolce syrup. To make a latte, add 2 tablespoons cinnamon dolce syrup into the cup and place a cup in place to brew. Brew 1 espresso Verismo pod. Next, froth milk: pour cold milk in a small saucepan over medium-high heat and heat until steaming, whisking occasionally using a small whisk or a fork. When it reaches the right temperature, remove from heat and whisk the milk vigorously until frothy. Slowly add frothed milk to your coffee. Add sugar to taste, and garnish with whipped cream and ground cinnamon. You can also use milk pod, but I do prefer fresh milk. To make a latte with a milk pod, start with cinnamon dolce syrup, brew 1 espresso pod and then brew 1 milk pod. Garnish with whipped cream. This recipe makes 6 oz latte, so if you want to make a big cup, you can double it. Use 2 espresso pods, 10 oz cold milk and 3-4 tablespoons syrup to make a tall 12 oz drink. Also, for this recipe, you can use store-bought cinnamon dolce syrup or you can make homemade syrup. To make a syrup, mix 1 cup water, 1/2 cup white sugar + 1/2 cup brown sugar, and 1 tbsp ground cinnamon in a pan and simmer for 10 minutes. Remove, add few drops of vanilla extract, stir and allow to cool. You can store this syrup in refrigerator for up to 10 days. I hope this helps! Enjoy! Thanks for the great recipes! I was wondering if you have a recipe for a white russian latte or frappe. It’s my husband’s favorite. here’s how to make White Russian at home: fill a short cup with ice, add 2 ounces vodka, 1 ½ ounces coffee liqueur (such as Kahlua) and 1 ½ ounces half and half. That’s it! 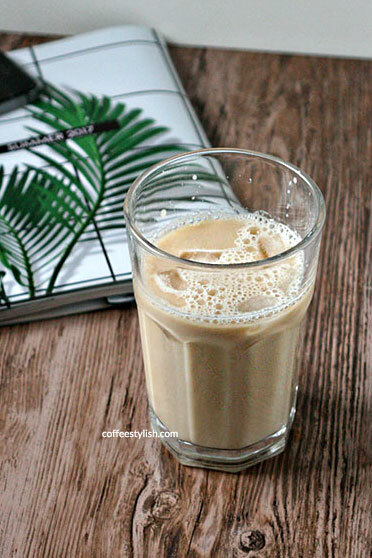 If you don’t have coffee liqueur and you want to use your Verismo machine to make this recipe, you can brew 1 espresso pod and use espresso instead. For a frappe, brew 2 espresso pods. If you don’t like your frappe too strong you could probably use one espresso pod, so I suggest to give it a try and see which you like better. In a blender, combine your freshly brewed espresso, 1/2 cup cold milk, 1/2 cup ice cubes and 1 tbsp sugar and blend until frothy. That’s my basic recipe. I like to add 1-2 scoops vanilla ice cream, but that’s optional. Or, you can add 2 tbsp chocolate sauce to the recipe to make a mocha frappe. 1. fill the water reservoir to line. Then, plug the power cord. 3. The all three lights on front side should start blinking. Wait until they stop blinking, usually about 15 second. 4. When done, only the top button will light. That means that you need to rinse the machine. Place a cup on drip tray, make sure that the handle is closed and press the top rinse button. The machine needs some time to heat the water so you just need to wait. But it should work. When the cycle is finished (the water will stop dispensing and all lights will be on), repeat this 4 more times. Just press the button, wait until the cycle is finished and again. You need to rinse the machine five times when you first use it. Once done, empty the cup and your machine is ready for use. Now, you can make your drink. Put a clean cup on the drip tray. Open the handle, place a pod in the machine and close the handle. All three lights should light, so you can make your choice. For espresso pod press top button. For brewed coffee pod press second one. Let me know if everything works. Thanks! I apologize but i know i’ve done everything correctly just like you suggested and still no water comes out and it just makes a gurgle sound. Well, then there’s definitively something with the machine. In this case, it’s best to call Starbucks customer service at 1-800-334-5553 or send them an email to verismocare.us@starbucks.com and see if they can give you further instructions. Good luck. I am experiencing the same problem. It makes noise but nothing comes out. We got it as a wedding gift, and I’d hate to have to ask the giver for the receipt in order to exchange it. I’m not sure if you still have this issue but when I opened mine I had the same issue, I was sure it was broken but I decided to hold down my rinse button (rinse for you is espresso), I held it down literally for about a minute or so and sure enough water came out! It chugged and chugged and then got smooth and water began to come out, I have not had it for over a day yet but I’ve made about 4 latte’s and have had no more issues. I think it needed to heat up and the time for the dispense is not long enough, I’m not really sure but I would definitely try that if you have not figured it out .